Becky of Project Domestication chose Burnt Sugar Ice Cream for her TWD pick and I am so excited! I finally have an ice cream maker (Sister in Law's old one)! So after making 2 batches of the base, I got all my ingredients ready to start, but when I started reading the manual it said I also needed lots of ice and salt to add to my mixer! *sigh! I thought only those old hand crank mixers (like my Dad's) needed salt and ice? lol. So I had to wait later to make it, when I could get them. So once I had them, I set it all up ready to go, and the darn thing wouldn't start! WHAAT? Mr. took it apart and realized the motor had rusted out. Toast. I really didn't want to freeze it by hand. So I jumped on Ebay (knowing I'd have days to wait), then Mr. said Craigslist! Duh! LUCKILY there was 1 in my area for sale! 2 towns over, 1 hour and $20 later, I was freezing my new-to-me ice cream maker bowl. The first batch I made went in when ready, it took 50 minutes and it was still very soft serve. I froze it in a bowl anyways to harden more. Then I refroze the ice cream maker bowl even longer for my 2nd batch, I wanted it COLD. The next day we ate batch #1 and it finally hardened enough where you could eat 1 scoop without it melting. Yay! (fyi- 1 batch fed the five of us 1 scoop + 2 extras). Batch #2 even though the base sat in the fridge a couple days during this ordeal, came out great. In fact I got more volume while churning it than #1 and I only let it go 40 minutes the max. time, and gave it a day to freeze up as well. I'm sure glad I started this early in the week! Whew! We all loved it! This ice cream is rich, caramely, and very very good. It was pretty easy to make, just a lot of patience is needed while heating and stirring the cream, milk and sugar base. The sugar will harden up, but keep stirring the cream and milk over it, and it'll dissolve and be ok. This is my second time ever making ice cream. My first time was another of Dorie's TWD recipes, but I had to really make it by hand, and it took forever to freeze up, but it was good! 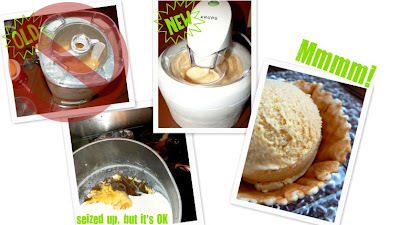 So if you'd like to make this wonderful ice cream, and preferably have an ice cream maker, freeze the bowl well ahead of time, and visit Becky's blog for this recipe. it looks lovely and creamy. great for anytime eating :) i want that waffle cone. Wow--you worked hard for this ice cream! I think you deserve another scoop, if there's any left. The waffle cone bowls are so cute! Delicious ice cream AND a great deal, too? You rock. I love your waffle cone, so cute! Loved this ice cream, I could eat some right now! This was really good wasn't it. Glad you got a new ice cream maker so you can make more ice cream. Aren't they fun to use. Looks perfect in the waffle cone bowl.